Things I liked: Same as the magazine that comes with the SIG Sauer P226 X5. Things I would have changed: It's little over-priced (not Pyramyd Air's fault) and the manufacturer should include an extra plug/cap as it's pretty easy to strip. What others should know: The first one that I received leaked CO2, but Pyramyd Air quickly resolved the situation. I cannot recommend Pyramyd Air highly enough! Things I liked: First of All I like that Pyramyd Air still carries this Magazine ! I checked multiple sources , and to No-Avail , Nobody carried this .177 Magazine ! This Sturdy , Well Pressurized , Quality , Magazine by Palco , engineered by KJW's original Sig Sauer spec's , is a MUST have and welcomed spare Magazine for Your P226 X-Five GBB Pistol. Besides it's Rugged construction , and it's ability to hold 18 steel .177 BB's ,, Plus Pyramyd Air's Discount and it's 30 day Warranty ,,, You CANNOT Go WRONG !!! What others should know: I do believe that the First Quality an Airgunner like myself is looking for is REALISM in the Air Gun they are Buying . This Cybergun Magazine has All the attributes , and then some ! Things I liked: Ok, you gotta do some mag swaps during your shooting, right? This is the same that came with the gun, so not much else to really say. It works unless it leaks. Things I would have changed: I had a CO2 leak on one of my mags after probably 10-15 CO2 cartridges. Better reliability would be nice. Also make the follower lock (and stay locked) BELOW the fill hole for easier loading. I have had trouble with the follower releasing while loading, flinging BBs all over. What others should know: Pyramyd more than made up for the defective unit by shipping me another one. They are awesome! Things I would have changed: Everything as it does not work well with the Sig P226 X Five Open Combo. It has a flat base and does not have the extending base bumper that comes with the mag supplied with the pistol. Hence, It has to be shoved into the pistol and the follower often sticks and does not keep pushing the bbs up. What others should know: Look around for the mag that comes with the pistol. The mag's with extended base used to be sold here. These ones still work fine with the X-Five Open especially if you remove the oversized mag. well. I have both types and have no problems with either; no sticking of the follower. Things I liked: It's hard to like something I wish I had not bought. Things I would have changed: Correct listing to show that this is unsuitable for the P226 X-Five Open model. What others should know: This mag, while listed as a recommended accessory by Pyramyd for the X-Five Open (model 28852), is not suitable for that model. And as far as I can tell, no extra mags are available for that model, which has an extended mag well and requires a magazine bumper 1/4" longer than this one. This mag can be shoved up deep inside the X-Five Open and will function so I'm keeping it, but feel I was misled. For the record, the mag's packaging says it is meant for the model 28851 and the item's description does say that it fits models with fixed sights, but I trusted the recommendation, which was in error. And speaking of errors, the packaging says it holds 21 rounds, not true. These DO work for the X-Five Open...if you remove the oversized mag. well. They also work with it but just not as fluid of an insertion because you have to palm the front of the base into the well. PyrAir used to have the ones with extended mag. base, don't know why they disappeared. I now regret not buying some when they were available--especially when both mag's were cheaper. To claim that these aren't suitable is incorrect. Things I liked: I really like the fact that it is a replicated model of the actual magazine belonging to the Sig X5 that many special forces and several law enforcement agencies use. The mag is heavy and designed exactly like a real Sig Sauer mag with floor plate and frame work. Things I would have changed: I would only make the Co2 feed line and seal in a better quality since I had one out of three purchased mags replaced. What others should know: I don't suggest using finger nails for holding the spring follower down while loading. Try using a small to medium flat head screw driver. Things I liked: The realism to other SIG magazines is really nice. The fact that it holds the CO2 cartridge and the BBs in a plus for ease of operation. What others should know: The magazine capacity stated is one BB too many. Things I liked: This is a high quality magazine that is totally reliable. Things I liked: I like the way it ejects and is put back in the gun. Very realistic. Things I would have changed: The spring catch that you hold back to load is to small and I'm constantly ripping finger nails. What others should know: I load around ten the first few loads and six after that. If to many are loaded it cool to fast and lessens the number of shots per co2 cartridge. You Probably do not maintain , nor have the respect for the Product . It most certainly is Not Junk . Things I liked: It's a OEM Cybergun magazine. Things I would have changed: The spring hold back "notch" (same as the mag that came with gun) is horrible.. design flaw.. Things I would have changed: capacity? Things I liked: I ordered this directly from PyramydAir after I was returned previous order made thru the Amazon, because it was wrong caliber. Return it with Amazon/PyramydAir was very easy and with new order I got just what I was looking for, mag to my Sig 229 X-Five with blow back and it fit perfectly. Things I would have changed: Nothing to change. Customer service of the PyramydAir is exelent. Things I liked: nice to have extra mags to shoot longer was great first outing. Failed second time using leaks co2 now completely useless. Things I would have changed: USE A MOLY RESIN FINISHED ON THE THE MAGAZINE TO PREVENT SCRATCHES AND ADD THE BULLET COUNT LINES LIKE ON THE REAL MAG. ALSO ADD THE CALIBER ON THE MAG. 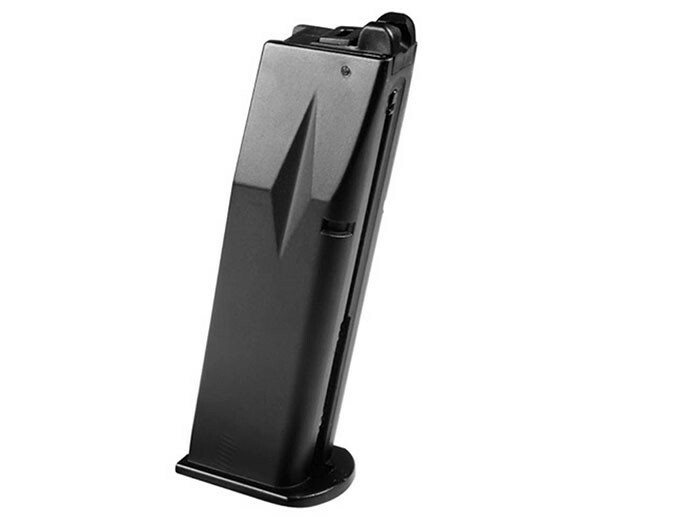 What others should know: THIS MAGAZINE IS VERY DURABLE AND RELIABLE. I DON'T SEE ANY FUTURE LEAKS IN THE RELEASE VALVE DESIGN. THIS IS THE WAY I WOULD HAVE DESIGNED THIS VALVE. YOU SHOULD YEARS OF GOOD SERVICE FROM THIS MAGAZINE. IT IS TRULY WORTH THE MONEY. Learn to NOT YELL when typing!!!! All-caps is indicative of ignorance and lack of consideration. Things I liked: extremely useful item! - be aware that all realistic blowback full metal guns spend lots of CO2 for moving slides and cocking the hammer. As a result you may have only 30-50 good shots with a single CO2 cylinder. This mag holds both BBs and CO2; so using two mags in rotation makes the fun last two times longer - up to 100 shots without replacing CO2. Buy it! !